This ketchup recipe has 75 percent less sugar than our classic ketchup, but 100 percent of that rich tomato flavor. Just like all Heinz® Ketchup varieties, it contains no artificial colors, flavors or preservatives. 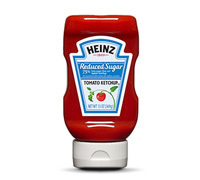 And the top-down bottle and Stay-Clean Cap® make serving our Ketchup as easy as enjoying it. It's no wonder Heinz® Tomato Ketchup is the world's favorite. Only the firmest, juiciest, freshest tomatoes make it into our bottle. Every tomato in every bottle of Heinz® Ketchup comes from Heinz seeds and is grown by farmers we know and trust.